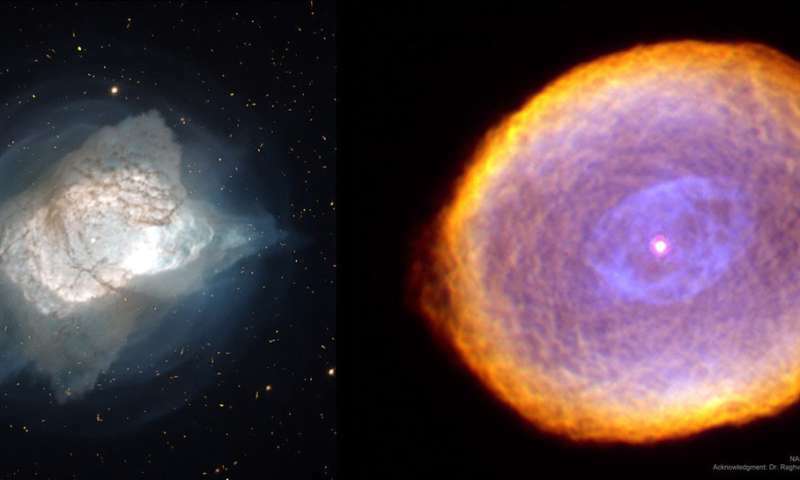 An international team led by a Ph.D. student from the Instituto de Astrofísica de Canarias (IAC) and the University of La Laguna (ULL) has identified the emission of tellurium in the infrared spectra of two planetary nebulae and bromine in one of them. At the end of their lives, stars of moderate mass eject their outermost layers forming planetary nebulae. Through this process, they inject into the interstellar medium the chemical elements that have been synthesized inside them for billions of years. Those elements that are heavier than iron cannot be produced in the nuclear fusion reactions that occur inside stars because that process would require more energy than they could generate. These elements are formed by a process known as neutron capture, which occurs in the final stages of a star's life. "As they occur, these neutron captures give rise to increasingly heavy elements," explains Simone Madonna, a Ph.D. student at the IAC and lead author of this paper. And he adds: "This physical phenomenon always occurs during the last episodes of the lives of stars: either in violent events related to the death of very high mass stars, such as supernova explosions or neutronstars collisions (one of which was recently detected by gravitational wave observatories), which generate a huge number of free neutrons, or in the final phase of the life of low mass stars (between 1 and 8 masses of the Sun), where the neutron flux is much lower. In the first case, the process is called the "r-process" (R for rapid) and in the second case, the "s-process" (S for slow). Jorge García Rojas, postdoctoral researcher at the IAC and Simone's Ph.D. supervisor, states that " we have detected, for the first time, a spectral emission feature of tellurium in the infrared spectral range of two planetary nebulae (and bromine in one of them) thanks to the data obtained with the EMIR spectrograph, on the Gran Telescopio Canarias, and IGRINS, on the Harlan J. Smith Telescope, at the McDonald Observatory in Texas, USA." Taking advantage of the technique of spectroscopy, we analyse the light we receive from the nebulae, which is decomposed into different colours like a rainbow, and we can determine which chemical elements are present in the gas, as each element has a unique pattern of emission lines embedded in this rainbow, the spectrum of a nebula. Thanks to this, a tellurium emission line and a bromine emission line have been located for the first time in the infrared spectrum of planetary nebulae. These are the clearest detections of ions belonging to these two heavy elements in one of the places where they form. "The use of large telescopes and specific instrumentation is necessary due to the extreme weakness of these lines, since they correspond to elements in the Universe with very low abundances," comments Francisco Garzón, another of the authors of the paper, who is professor at the ULL, researcher at the IAC, and the researcher in charge of the EMIR instrument. "To determine the abundances of these elements, we have needed to perform a theoretical atomic model to calculate the atomic parameters of the observed ions," explains Manuel Bautista, an atomic physicist at the University of Western Michigan and co-author of the article. The importance of the detection of these lines in planetary nebulae is based on the fact that they are better indicators of the abundance of the element than the lines detected in evolved stars and give us the opportunity to study the element at its place of origin. Tellurium is of particular importance as it can be produced by both r-processes and s-processes. "The calculated abundances of Tellurium in the planetary nebulae NGC7027 and IC418 indicate that this element is much more abundant than expected in the solar vicinity, where the abundance pattern is distributed as expected if the r-process were responsible for the origin of these heavy elements," notes Simone, "so some of the tellurium in these planetary nebulae must have originated through the s-process. Nicholas Sterling, professor at the University of West Georgia and Simone's Ph.D. co-supervisor, states that "investigating these elements in all their places of origin (planetary nebulae, neutron star mergers, and supernovae from massive stars) helps us to better understand the contribution of the s-process and the r-process to the formation of heavy elements, and to refine theoretical models of the chemical evolution of the Universe."